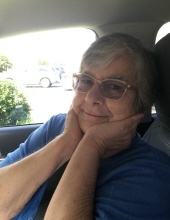 Linda Ann Meade of Hartly, DE passed away Sunday, March 31, 2019 at her home. She was 68 years old. Mrs. Meade was born May 20, 1950 in the Kensington suburb of Philadelphia, Pennsylvania to the late Theodore Warrington, Sr. and Marie Ellen McAhon Warrington. She was a homemaker and loving caretaker to her husband prior to his passing. She enjoyed trips to the Philadelphia Flower Show and birdwatching. She often gave her family wise words of advice. She especially enjoyed spending time with her grandchildren: Alyssa, Aimee, Erik, and Emily along with her fur-grandchildren: Princess, Precious, Rocco, Daisy, Maeve, Bella, and Baby Kitty. She enjoyed spending time with her friend Cathy Miller, Linda Green, and various other friends. Mrs. Meade was a devoted Catholic, loved reading the bible, and was a member of various Christian organizations. She often donated to various charities that help children and animals in need. In addition to her parents, she was preceded in death by her husband Robert Meade, their daughter Cherrene Meade, and her brother Theodore Warrington, Jr.
She is survived by her brothers Bruce Warrington, Sr. and Robert Warrington, Sr., her sisters Carol Bilger and Marie Streeter, her son Timothy Meade and his wife Peggy along with their children Erik and Emily, her son Kevin Meade and his wife Jennifer along with their children Alyssa and Aimee. Funeral will be held at 10AM, Monday, April 8, 2019 at the Delaware Veterans Memorial Cemetery, 2465 Chesapeake City Road, Bear, DE 19701. In lieu of flowers the family suggests contributions be made to Operation Blessing, Meals on Wheels, and First State Animal Shelter. To send flowers or a remembrance gift to the family of Linda Ann Meade, please visit our Tribute Store. "Email Address" would like to share the life celebration of Linda Ann Meade. Click on the "link" to go to share a favorite memory or leave a condolence message for the family.